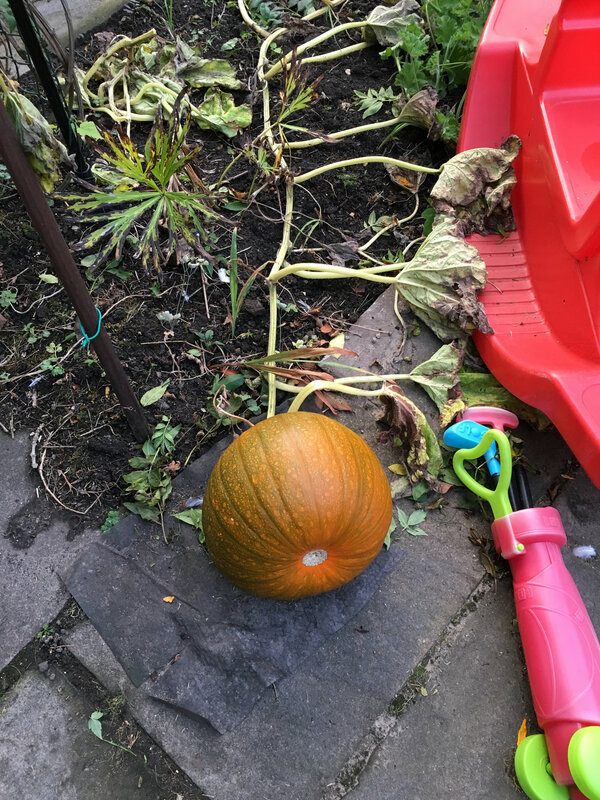 So last Halloween I decided to save some of the pumpkin seeds from the pumpkin I’d carved with my then 4 year old daughter to plant next year. After drying and storing seeds over winter we planted them in spring potted on and hardened off then watered and fed over summer until we ended up with 2 surviving vines with 1 pumpkin on each (one big one small). Problem We have is the plant with the small pumpkin is still quite healthy and the pumpkin is now almost totally ripened but the one with the larger pumpkin which me and Sophie were planning on carving for Halloween is dying. All the leaves have gone brown and the vine has gone soft where it meets the roots and the softness/rot is working it’s way towards our Halloween pumpkin! For the healthy plant which is ripe do I cut it now or leave on the vine until just before Halloween? For the dying plant which is not quite ripe do I leave it on the vine in till the last of the life is in the plant and it’s hopefully finished ripening or do I cut my losses and cut then stem and try and finish ripening it off in the conservatory? If I do this will it last until Halloween? Any advice would be appreciated I’d feel like such a failure to have to buy our pumpkins from a supermarket after all the effort we put in. Leave the one on the green plant unless you get a frost forecast, take the one in the picture off, cut it off with a bit of stem attached, at least 3 inches from the pumpkin. To make sure it'll last you should put it somewhere warm and dry so the conservatory should be fine. if you want to go a bit extra then wipe it all over with a weak bleach solution, that will help stop any rot setting in. Pumpkins will keep for several months so that one shouldn't have any issues surviving for 4 weeks. It looks a good pumpkin to me! When you harvest your pumpkins don't cut the short stem from the main vine ... make two cuts in the main vine ... one each side of the fruit stem, so that you have a 'T' shape ... this will help keep the fruit's stem firm and prevent any rot from spreading into the fruit. I grow Pumpkins for show and have never heard of using a bleach solution and would not recommend it ever. Dove is correct in the cutting always make the two cuts never cut the single point. Cut the pumpkin with the grotty vine and store dry and warm just wipe any dirt off with damp cloth then dry. The other leave water and feed it will last to end of October if you have a frost forecast cover it with fleece or newspaper. My first show is October 27 so I will cut the Pumpkin just 3 days before clean and dry keep in the store until needed. Bleach is a very common treatment for pumpkins that are going to be stored. I was also skeptical when I came across it on American sites. so I did a little experiment I had 8 pumpkins between 20 and 40kg each which I was going to store over winter for chicken feed. I wiped half of them down with 1/10 bleach and the other half I left. These were stored on pallets in a frost free barn (not as warm as they would like but I don't have space in the house for that kind of volume) The ones that had been washed down lasted on average 6 weeks longer than those that had not. 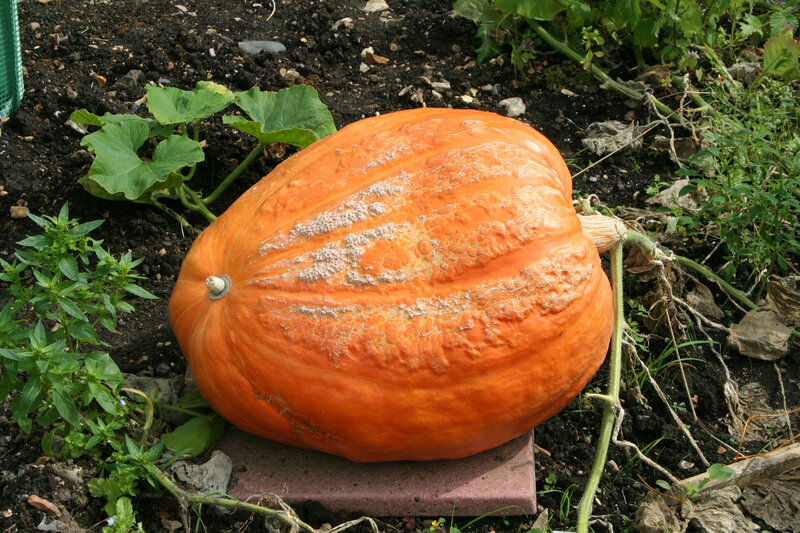 Of course if you are showing and will use the pumpkin within 3 days of cutting... not much point it has no chance to rot. Cut it with the extra bit of vine attached and washed with antibacterial wipes. Leaving it to hopefully get a bit more colour in the conservatory.